JazzRights.com is born! 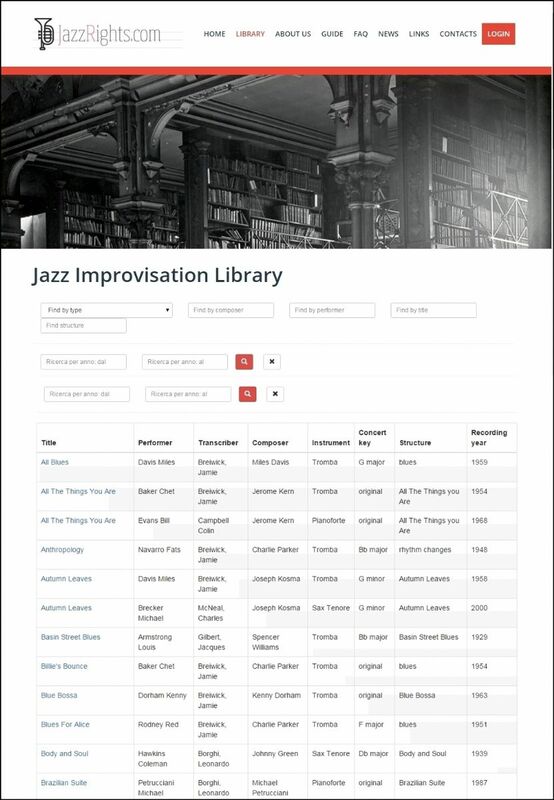 A new concept to collect in a Library jazz improvisation! The piano crossover course is an innovative artistic-professional-educational synthesis. It is aimed at classical pianists, young jazz pianists who do not have a lengthy classical academy preparation, and at the many already active semi-professional pianists. The learning centers on those simple, foundational, and creative aspects that are not often included and valued in formal instrumental learning. The course teaches versatility and interdisciplinarity between musical types and identities. It includes the preparation necessary for crossover work engagements - which are ever more common for today's pianist. There will also be an orientation on regulations and Italian legislation regarding performances: Siae, Enpals, freelance and subordinate work, tax regimes and terminology. Arm gravitation piano technique; proper key "touch"; modern harmony & chord substitutions; improvising; melody exposing and paraphrasing in jazz and popular music; comping techniques with left hand in piano solo (romantic, swing, latin, ..). Instantaneous arrangements, melodic counterpoint between hands. J Music sas is searching for Authors and Composers to add new scores to its catalogue, with a preference for musicians who perform live. We offer an excellent editorial contract. Information on your personal activity, address and Authorization to process Personal Data under the current law (Law n. 196/2003) in Word format. The pieces should be unpublished but can already be registered. In this case, following acceptance of the piece by J Music sas, the company will take care of making a substitute registration by signing the new Siae "Declaration Form", form 112 (details of the original deposit should be indicated: the repertoire date and number).